When I read the premise for BLOODRUNNERS, I was immediately intrigued. Vampires are obviously nothing new in the world of horror; however, putting them in historical situations is usually interesting. Such is the case here; I can’t recall seeing any movies in the past that had these creatures of the night running around during Prohibition Era America. So I jumped at the chance to give this one a look. Unfortunately, the film doesn’t quite live up to its promising premise. Granted, it is somewhat entertaining, but it still lacks that certain spark that great movies contain. I won’t say this is a terrible film, but it’s not one I’ll be revisiting anytime soon. By 1933, Prohibition has proven a booming enterprise, where average citizens break the law, hide in the shadows and operate at night. The new world order has even lined the pockets of corrupt cops like Jack Malone (McFadden). He collects a ‘luxury tax’ from every bootlegger and scofflaw in the small town he has sworn to protect. While shaking down the newest speakeasy in the local underground, Jack and his men uncover a clan of vampires, hell bent on taking over the town. 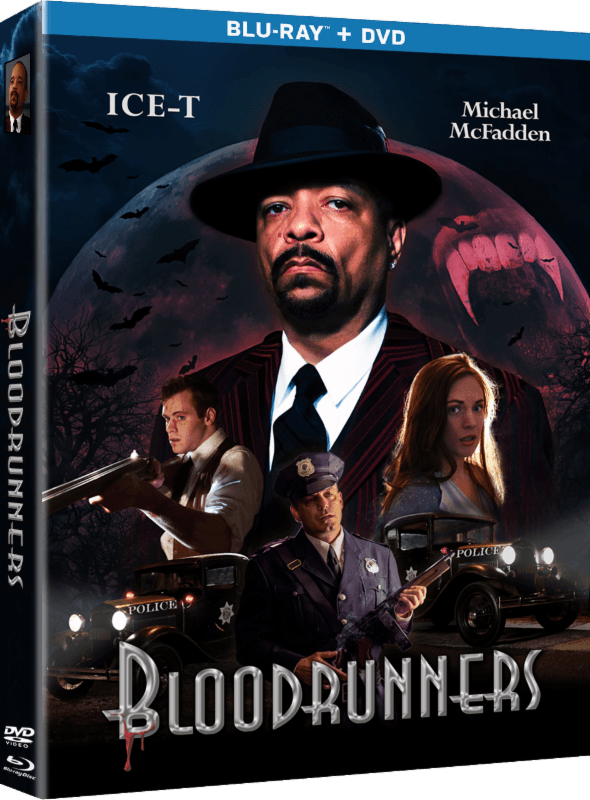 Now Chesterfield (Ice-T), an ancient vampire, and his horde must hide their secret at any cost. The bloody result leaves several bodies and innocent townsfolk taken as lambs to await the slaughter. With nowhere else to turn, Jack joins forces with a busboy and a crazy preacher to save the town and make a final stand against Chesterfield and his vampires. Despite its lower-than-average budget, the production crew does a fantastic job in their attention to detail in this movie. The film is chock full of 30s-era memorabilia, which cranks the “realism” factor up several notches. I won’t say EVERYTHING necessarily fits in that specific year in which the film is set (I swear I saw a calendar in one scene that said 1935 instead of 1933), but only diehard history buffs and antique car collectors will probably be able tell the difference. BLOODRUNNERS is shot fairly well and looks decent onscreen. As mentioned, the attention to detail is impressive, as are the sets and locales. I particularly like the house used for the brothel and the bar itself; both locations are exactly as I would picture them as being in the 1930s. The acting is so-so, with Ice-T headlining the cast. I enjoy him on LAW & ORDER: SVU, so I was looking forward to seeing him in this. His talents, however, are wasted on this film. He does not have much screen time overall, and the schlocky scriptwriting never lets him flesh out his character. Michael McFadden, who plays the crooked cop Jack Malone, does a great job, however. I had no trouble believing in his character. And speaking of the script, it’s nothing to write home about. Sure, the idea is solid, but the execution lacks any kind of flare. The dialogue is clunky in places and the characters do some questionable things every now and then. The result is a lackluster period piece that fails to frighten, although the storyline is vaguely entertaining if viewed as a historical drama instead of horror. The special effects in BLOODRUNNERS are laughable. The overuse of CG images kills any kind of realism the film might have offered. The CG looks decent in the gore department, however it is very obvious when it comes to gunfire. Muzzle blasts take a lot of effort to duplicate, and they look way too fake here. BLOODRUNNERS is a ho-hum vampire movie that should almost focus on a story without the vampires. Doing so might make this a more enthralling film. As it is, I’m wary of recommending this to anybody except diehard Ice-T fans, and even then, I’m not too sure I would. For the most part, I would steer clear of this one.